Happy Joe thought his online business was going smooth. His website was getting decent traffic, he had engagement on his social media channels - until a reality dawned upon him. There were no conversions. His website visitors were just that - visitors; none of them converted into customers. And thereon he became Sad Joe. Traffic and engagement define the success of your marketing efforts, but conversions define the success of your business. However, as per a recent research report only 22% businesses are satisfied with their conversion rate. Why? 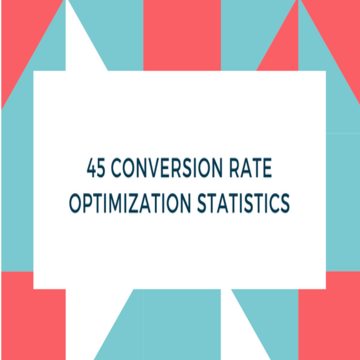 Because most of them hardly understand the value of conversion rate optimization (CRO). Probably this why businesses spend $92 acquiring customers but only $1 converting them. 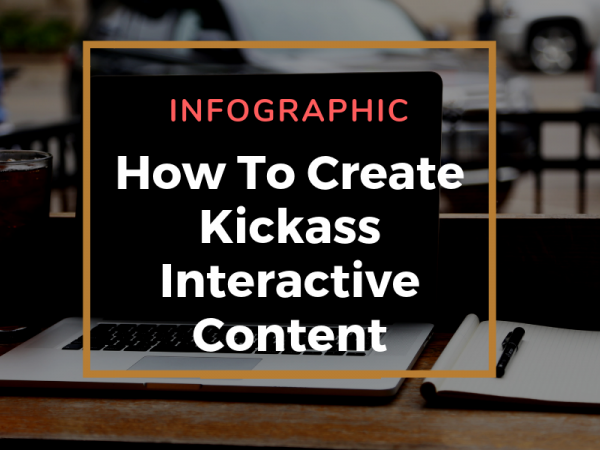 Interactive content experiences like calculators and quizzes, which are being widely adopted by marketers for engaging prospects and generating leads, can help increase website conversions and increase sales. As a matter of fact, they can get you 2X the conversions when compared to passive content. Yet, you’re here, still thinking how you can use these content marketing marvels on your website. To answer the concern, we bring to you fantastic four ways you can use interactive content on your website homepage to get more leads and increase ROI. This is the first action trigger visitors notice on your homepage. However, a generic CTA can kill this chance for you. Your call-to-actions should be personalized and promise a value add. According to Hubspot, personalized CTAs convert 42% more visitors into leads. And nothing spells personalization better than an interactive experience. 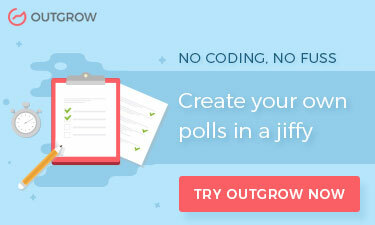 Using a quiz or calculator as a primary CTA tells your visitors that you intend to solve their problems and add value to them, and not just sell. Moreover, this doesn’t require the visitors to make any commitment. This not only improves your brand value but also gets you high conversions. 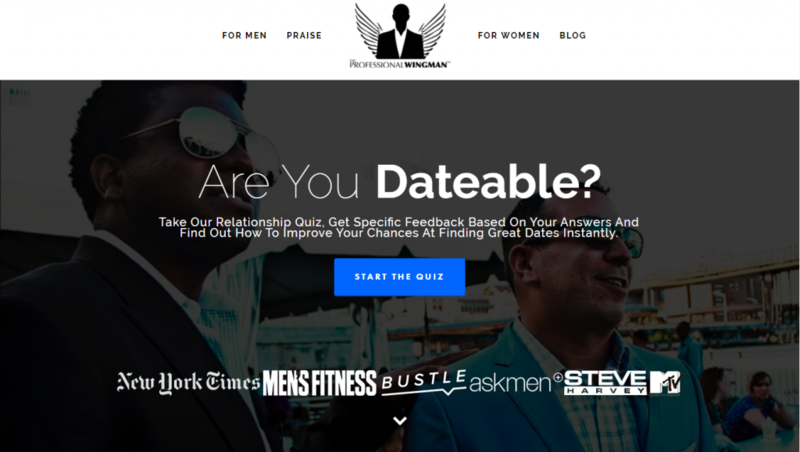 The Professional Wingman, a premier social strategy company for professional singles looking to better their personal relationships, uses a quiz ‘Are You Dateable?’ as a primary call to action on their homepage. With just 14 questions, this quiz answers the most pressing question each singleton has on his/her mind. And a well placed lead generation form, just before the results, ensures that visitors turn into leads. 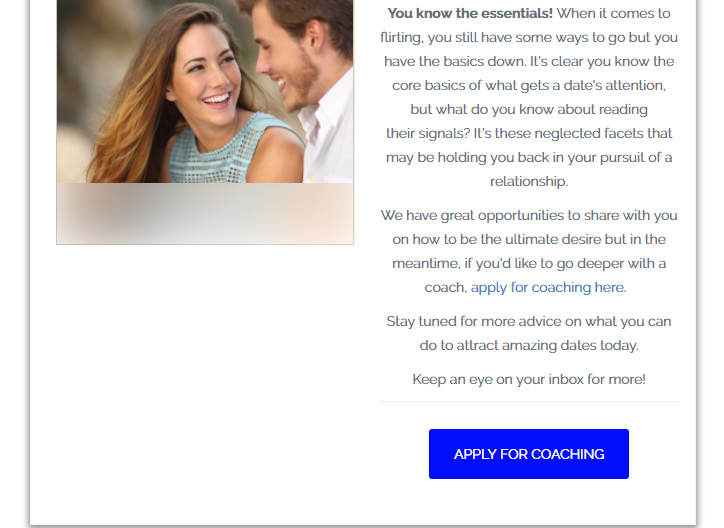 And finally the CTA on the results page leads them to the page where they can sign up for a personal coaching. Thanks to the quiz, the team has received 1471 leads so far from 2981 visits. Tanner Guzy at Masculine Style, did the same and got a whopping 1310 leads! The secondary call to action acts like your backup plan. It leads your visitors to an alternate path when they’re not ready for something as high-commitment as you’re asking. It is a way of keeping the prospects engaged until they are ready to convert to the next stage. So, how can you use a calculator or quiz as a secondary CTA? Consider this example. You have a software product. The primary call to action on your homepage asks your users to take a demo of your product. Now think from the visitors perspective. May be, they want to know a little more about the product or the concept behind it, before they use it. In that case, it’s a good idea to have a quiz or calculator as a secondary CTA to avoid drop offs, and help visitors move ahead in the funnel. For the example I took here, a comparison calculator - ‘How the product stands vs. competitors’, an industry related quiz - ‘Do you actually know ‘Y’ well?’ would do well as secondary CTA. The Fifth Element life uses quizzes as their secondary CTA on the homepage and has received 955 leads from 1688 visits so far from one of the quizzes! As the name suggests, this bar welcomes your users, sitting right at the top. It can be used to welcome them or display an offer to entice them or to make an announcement. But what if you could use this part of the page for something better? 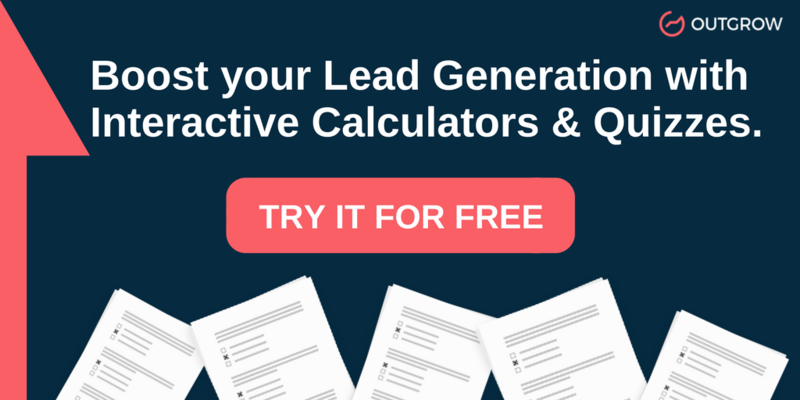 Say generating more leads or getting more conversions?! Eye tracking studies reveal that when users land on your site, their eye path starts from the upper left corner, and that is exactly where your Hello Bar sits. Thus, it makes complete sense to embed a business-relevant calculator or quiz in it. You can use this opportunity to educate your users about your product/services (think a knowledge or graded quiz) or help them make purchase decisions (think cost, savings, and ROI calculators). This is your last attempt at converting visitors before they leave your website. And the best part is, it works like a charm! You can gain 10-15% of lost visitors by adding an exit intent pop up to your website. And if you add a calculator or quiz to this popup, the engagement goes to the next level. It engages your visitors in an experience that educates rather than sells and thus, positively impacts their purchase decision. Take a cue from VisualDNA. The company uses ‘Who Am I’ quiz to gather insights into audiences. 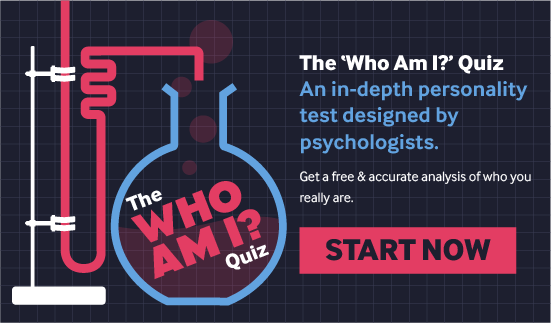 The quiz reveals people’s true identity based on psychological theory. This is a win-win situation as the company gets volumes of customer data in return. 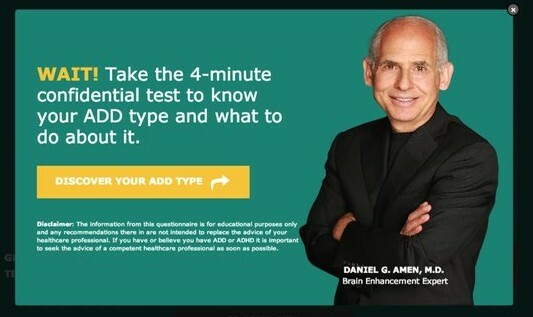 Similarly, Amen Clinic uses their exit popup to host a quiz that lets visitors find their ADD type. 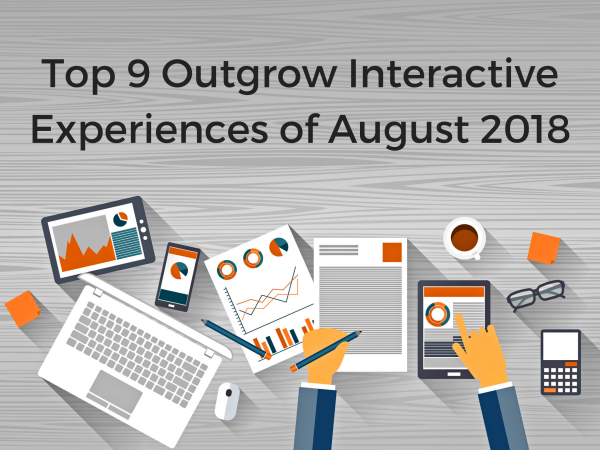 Interactive experiences are more than just engagement avenues. They improve conversion and get you business. It’s time you try them for your business.